Beamish, D. 2013. 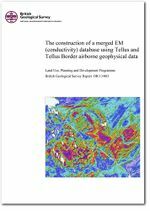 The construction of a merged EM (conductivity) database using Tellus and Tellus Border airborne geophysical data. (Land Use, Planning and Development Programme). British Geological Survey Internal Report, OR/13/003. This page was last modified on 10 November 2016, at 14:19.